Secondary, or therapy-related, acute myeloid leukemia (AML) developing after exposure to genotoxic agents accounts for approximately 10–20% of all AML cases. The prototype “induced AML” was described almost half a century ago in the setting of environmental exposures to DNA-damaging toxins including benzene, organic solvents, arsenicals and ionizing radiation ([Golomb et al., 1982]; [Mitelman et al., 1978]). The emergence of AML after cytotoxic therapy was initially recognized in patients with Hodgkin’s disease, one of the first malignancies cured with cytotoxic therapy. In the case of Hodgkin’s disease, the leukemia arises from the background of multi-agent cytotoxic therapy that includes alkylating agents, often in combination with radiation ([Levine & Bloomfield, 1992]; [Pedersen-Bjergaard & Larsen, 1982]). 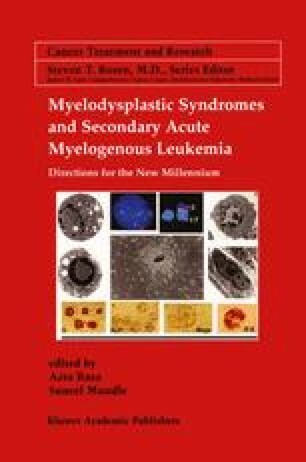 Recent reports of therapy-related myelodysplastic syndromes (MDS) and AML encountered in patients with Hodgkin’s and non-Hodgkin’s lymphoma following high-dose chemotherapy and autologous bone marrow transplantation (ASCT) have confirmed a positive relationship between the cumulative dose of alkylating agents and the risk of developing secondary AML ([Andre et al., 1998]; [Darrington et al., 1994]; [Harrison et al., 1999]; [Milligan et al., 1999]; [Pedersen-Bjergaard et al., 2000]; [Traweek et al., 1994]). In several studies, the cumulative risk of secondary MDS/AML has varied widely from 1.1% at 20 months to 24.3% 43 months after ASCT ([Pedersen-Bjergaard et al., 1997]; [Taylor et al., 1997]).